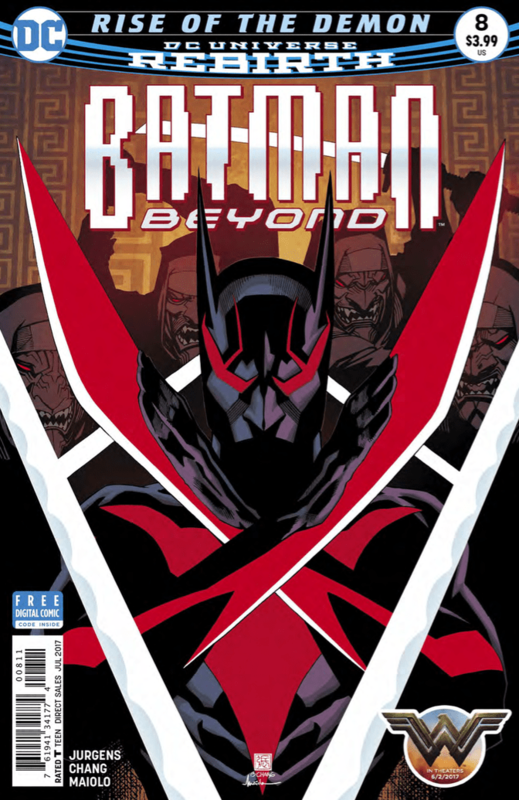 Batman Beyond #8 Review – AiPT! 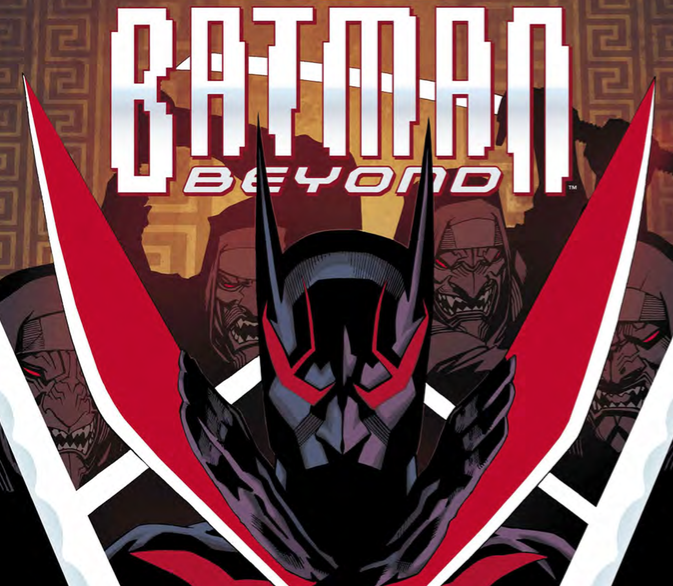 The last issue of Batman Beyond ended with quite the world-shaking revelation: Ra’s Al Ghul is alive! Now that an enemy more deadly than the entire League of Assassins has been revealed, how will Batman, Curare and Barbara handle this shocking news? More importantly, is it good? The issue opens with Batman, Curare and Barbara surrounded by dozens of defeated and very much deceased assassins. The rooftop of the Gotham police quarters is a bloody battlefield littered with blood, bodies, debris and a destroyed bat signal. Last issue, Batman arrived on the scene just in the nick of time to save Barbara and Curare from death’s grasp at the hands of The League of Assassins. With his new prototype suit, taking on dozens of deadly opponents was easy and enjoyable. Maybe a little too enjoyable? Ra’s Al Ghul is alive and plans on invading the remaining vestiges of humanity that are still recovering from the Brother Eye cyborg catastrophe. One of the key steps to achieve his sinister ends is a confrontation between his right hand man Koru and Batman! It was hinted in the previous issue that the suit Terry is wearing is a dangerous prototype; well, the hinting and subtlety are over. We quickly come to see that while greatly enhanced agility, speed and strength are awesome for combating the bad guys, they aren’t so great for Batman’s ego. Overconfidence quickly leads Terry past the point of no return, as the AI in the prototype suit blocks out all communications with the Bat Cave and leaves him with no other option but to confront Ra’s Al Ghul. As Batman journeys to Ra’s Al Ghul’s lair for an epic confrontation, we swing back to Gotham for a closer look at the story behind the creation of the prototype suit and why it was permanently retired by Bruce. Koru arrives on scene riding Curare’s summoned flier and immediately jumps down to engage her and Batman. Bernard Chang’s take on this scene leads us to believe that the height Koru jumps from is substantial. So color me confused when mere seconds after Koru lands, Curare is up atop her flier beckoning for Batman to join. I get it, ninja vanish and all that, but this seems to be stretching that trick just a bit too much. Especially considering that to join her on the flier, Batman has to use his suit’s flight capability. Which leads me into my next area of confusion: if Batman and Curare are finally together on the FLYING vehicle, why does she jump back down to engage Koru? Just fly away! The storytelling surrounding the suit is two-fold. We’re given an interesting high-tech device that in addition to enhancing speed, strength and agility, has a few high-tech tricks up its sleeve. This does a great job filling the gadget slot you’d expect for a Batman story set in the future. As for the other side of the coin, there’s a very close look at the ongoing struggle Terry and Bruce have been facing since returning from their unique imprisonments. As contact with Terry is severed a remorseful Bruce reveals the full extent of the danger behind the prototype suit and its double edged sword nature. The suit represents what Bruce originally tried to mold Terry into: a cold, focused loner willing to do whatever it took to complete the mission. The inner turmoil Terry’s been facing since coming back from Spellbinder’s torment is front and center. Giving in to the suit is like going back to exactly the type of hero he said he was done with. I’m really looking forward to seeing where Jurgens takes this. Bernard Chang has worn a lot of hats throughout his career–colorist, cover colorist, inker, and penciller. It’s easy to see why his resume is so long and impressive. Chang effortlessly provides us with assassins battling to the death, a futuristic cityscape, the Bat-cave, gadgets and more. The world of Neo-Gotham is epic in scale, reminiscent of Blade Runner/The Fifth Element and very easy to get sucked into. Hats off to Chang for a stellar job across the board. Putting my problems with ninja physics aside, this is a great issue. I’d venture a guess that Curare’s assassin in distress routine could all be part of a ploy to get Batman right where Ra’s wants him. But then again, given how her fight with Koru goes, it’s entirely possible that she was an unwilling pawn in a much larger plot. One of my favorite things about reading comic books is being surprised, especially when I think I know what’s going to happen. Jurgens caught me with a curve ball that I never saw coming and I absolutely love him for it. The last page of this issue had me exclaiming “Holy s--t!” so loudly and excitedly that my girlfriend came into my office to see what was going on. Dan Jurgens’ Batman Beyond has everything I’m looking for in a Batman comic: ninjas, gadgets, surprises and a badass super villain. Keep it coming Dan. Dan Jurgens' Batman Beyond has everything I'm looking for in a Batman comic: ninjas, gadgets, surprises and a badass super villain.